Monumental art has always caught the attention of the human eye. Whether painting or sculpture, these works are big, in more ways than one. They are artworks that are physically large, conveying equally large concepts. It’s no wonder that we, throughout history, have had a fascination with creating huge monuments to celebrate culture, beliefs and achievements. Take, for example, the Buddhas of Bamiyan, carved into the cliffs in the Hazarajat region of Afghanistan as early as the 3rd Century, or the presidential busts of Mount Rushmore created much later from 1927 to 1941. 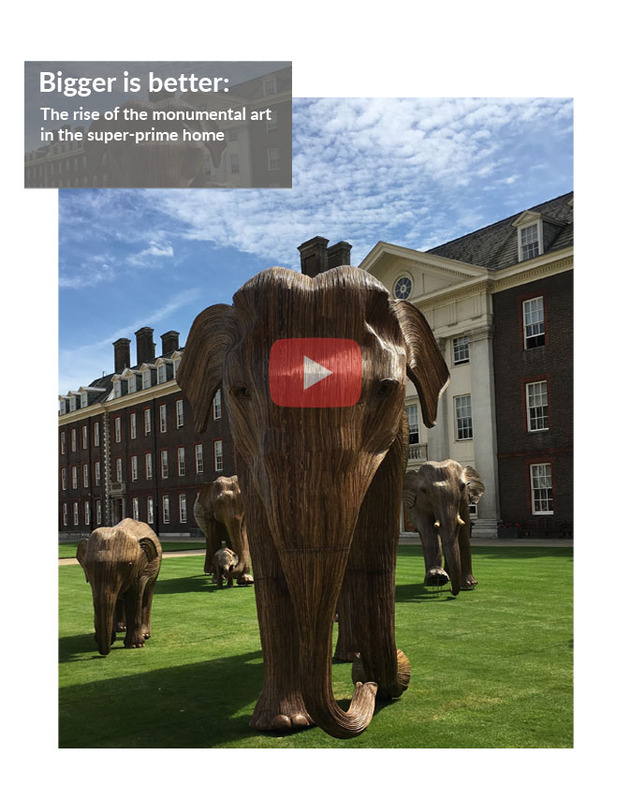 While traditionally monumental sculptures reside in prominent, public outdoor locations or art galleries, the trend for large-scale art has moved to the private homes of the high-net-worth (HNW) community in London. Over recent years, the modern art market for monumentally sized sculptures has been getting stronger, with owners of super-prime homes on the hunt for that perfect piece that will make a dramatic statement. Being inextricably linked to both the home contents moving marketplace and the world of fine art logistics, Cadogan Tate, has born witness first hand to this trend. Chris Evans, who heads-up Cadogan Tate’s Fine Art operation in London elaborates: “Over the last four years, we have seen a significant increase in demand for monumental sculptures in domestic properties in London. Given the size of the artwork we are talking about here, installation of these standout pieces is not a simple job. Most of these sculptures are designed and created off-site, which means utilising the right transport to safely move the artworks to their new location through the busy, urban streets. This may require road closures to safely manoeuvre the largest of designs, as well as heavy-lifting equipment and cranes to position the weighty pieces on specially reinforced floors. Then there are the health and safety implications and public-liability insurance policies required when dealing with such a large-scale movement. Keeping the prized artwork safe from harm is also a priority, due to the high value involved. Given the practicalities and complexities involved in adding a monumental sculpture to a private collection, why is it so popular among today’s HNW community? It is in part driven by the competition within the interior design sector, hired by super-prime home owners to create standout living spaces. Like the superyacht market, the designers are looking to make a name for themselves, commissioning one-off bespoke works of art for their clients, adding the ‘wow’ factor to their homes. It’s not just London that is seeing this demand for large-scale domestic art installations; it’s a global trend. For example, in 2016, Cadogan Tate’s Fine Art division received a request from a HNW individual to install a collection of artwork at his new home on one of the Balearic Islands. Built from scratch in the side of the cliff that had been terraced for this purpose, the only way the collection, which contained several monumental-scale pieces, could be installed was to commission a crane to be built on the cliff top to enable the art to be lowered some 120ft down the cliff face for installation in the grounds. While many monumental art projects are commissioned or collected by the super-prime home owners of London, the desire for bigger and better designs is not entirely the preserve of the HNW community. Father and plumber Colin Furze built a 5.5-metre high AT-AT as a play den for his children using parts and materials sourced from eBay on a tight budget. The Star Wars model now dominates the garden (and surrounding neighbourhood) of his Lincolnshire home. The rise of super-sized art has even hit the mainstream entertainment media, with Jeremy Clarkson’s The Grand Tour being heavily promoted by way of a massive eight-foot bust of the presenter’s head being placed in the front garden of a Manchester home, after it was won by the resident in a competition on Twitter. It doesn’t seem likely that the demand for monumental art in private homes will be coming to an end anytime soon. Cadogan Tate is prepared and equipped to deal with even the most complex of installation in the super-prime homes of the London HNW community, helping them to stand out from their peers on a grand scale.